I have a question. What makes everything better (besides chocolate…)? Of course, GLITTER! 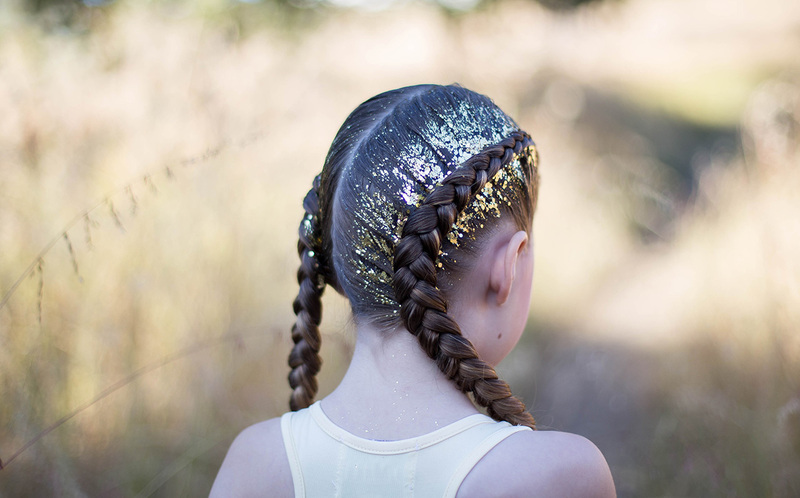 In this tutorial we have combined dutch braids and glitter for an easy hairstyle. You can use this idea for so many occassions. In summer add a boho dress and head out to your favorite festival. In the fall, add a poofy skirt and a unicorn horn and you have a magical costume! First part your hair. Katie started with a deep side part and went diagonal to the other side. But you can go down the center or even zig-zag! Secure one section with an elastic temporarily. Pick up a small section of hair from the front of the section you are braiding first. Divide into three pieces and begin a dutch braid. A dutch braid is done like a french braid only instead of crossing strands over the middle strand, you cross them under the middle strand. After the first complete stitch you will pick up a small section of new hair and add it to the outer strands before you cross under the middle strand. Continue braiding until you reach the bottom of the hair. Secure with a small elastic. Repeat a dutch braid on the opposite side of the head. Next you need some hair gel and glitter. Mix them together in a small bowl and brush on your hair where desired. Click on the video link above to see the ombre method Katie used on Charley. This week on Brooklyn & Bailey… “What We’re Made Of” We are so excited to share our 3rd original song video!